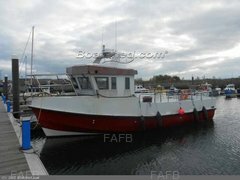 Recreation, Work Boat, Diving, Leisure, Fishing. 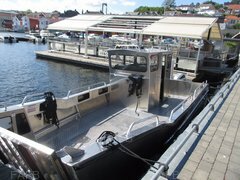 “Justice 21” (special built heavy duty model, made by the Boston Whaler Brunswick Corporation for military, law enforcement, rescue and commercial purposes). Factory fitted with 4 point lifting, perfect for quick davit launch and recovery. Also factory fitted with full length fendering. 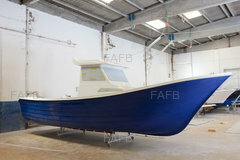 The Justice 21 is extremely versatile, great for commercial harbor use, fishing, patrol, tender, or a family leisure boat. This is an extremely robust and safe boat to operate. 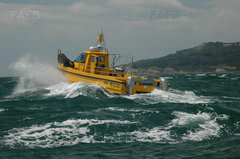 The deep ‘Vee’ hull enables the boat to glide through rough seas, giving a smooth and dry ride. The Justice 21 also has the renowned unsinkable hull. With a high internal freeboard and a beam of 8ft 6in, the boat is extremely stable. The boat hardly moves while moving around the deck space. Storage: Large bow compartment, anchor locker. Storage: Large in console area / Under seat locker. Owner manual for boat, equipment and machinery. Any inspection welcome, viewing by appointment only.